by Bill Roberts - Clomid is the anti-estrogen of choice for improving recovery of natural testosterone production after a cycle, improving testosterone production of endurance athletes, and is also effective in reducing risk of gynecomastia during a cycle employing aromatizable steroids. While it has been claimed that Clomid "stimulates" production of LH and therefore of testosterone, in fact Clomidâ€™s activity is achieved not by stimulation of the hypothalamus and pituitary, but by blocking their inhibition by estrogen. Clomid is a mixed estrogen agonist/antagonist (activator/blocker) which, when bound to the estrogen receptor, puts it in a somewhat different conformation (shape) than does estradiol. The estrogen receptor requires binding of an estrogen or drug at its binding site and also the binding of any of several cofactors at different sites. Without the binding of the cofactor, the estrogen receptor is inactive. Different tissues use different cofactors. Some of these cofactors are able to bind to the estrogen receptor/Clomid complex, but others are blocked due to the change in shape. The result is that in some tissues Clomid acts as an antagonist -- the cofactor used in that tissue cannot bind and so the receptor remains inactive -- and in others Clomid acts as an agonist (activator), because the cofactors used in that tissue are able to bind. 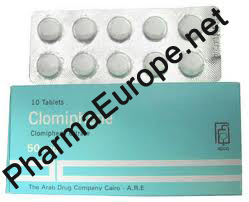 Clomid is an effective antagonist in the hypothalamus and in breast tissue. It is an effective agonist in bone tissue, and for improving blood cholesterol. Clomid also has the property of reducing the adverse effect of exercise-induced damage of muscle tissue. This is very significant for endurance athletes but is not very significant, if at all significant, with reasonable weight training. Clomid does not perceptibly affect gains of the weight trainer either favorably or adversely in my experience. The drug seems to have estrogenic effects on mood, which can be beneficial (improving relationships with women by improving empathy) or can yield depression or PMS-like symptoms, but for most users there is no significant effect either way. The claim that duration of intake should not exceed 10-14 days is incorrect. Clinical studies with male patients have been for periods of a year or longer. This error probably originates from the fact that, for use in women, due to the menstrual cycle there would obviously be no point in trying to stimulate ovulation all four weeks of the month. Thus, use in women is limited to 10-14 days. That limitation is not because of toxicity. Clomid is in fact useful throughout a cycle if aromatizable drugs are being used. I do think however that to be conservative, one should use it no more than 2/3 of the time throughout the year or a little less.